Before we set off to the site, the bright and sunny morning brought clouds of Red Admiral butterflies to feed in the branches of of an apple orchard. On site, all of yesterdays deturfing has meant that both Trench 2 and Trench 3 could be worked upon this morning. Amanda excavated Trench 3 right down to the bedrock. This demonstrated that this slope indeed a part of the outcrop and not constructed. I was intrigued to see the natural stone surface exposed like this, and wondered what the outcrop had looked like when people were here in prehistory. 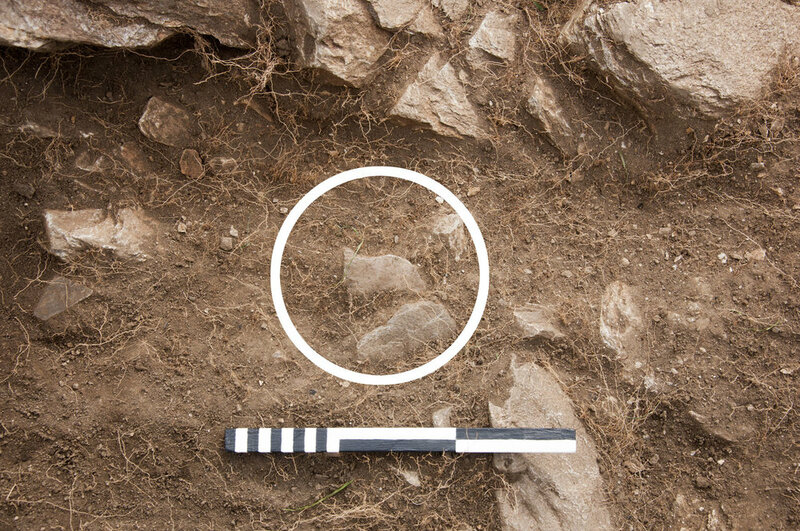 Archaeologists describe rock as a ‘natural’ feature, but it seems very unlikely that it was thought about in this way when the cup marks were made. 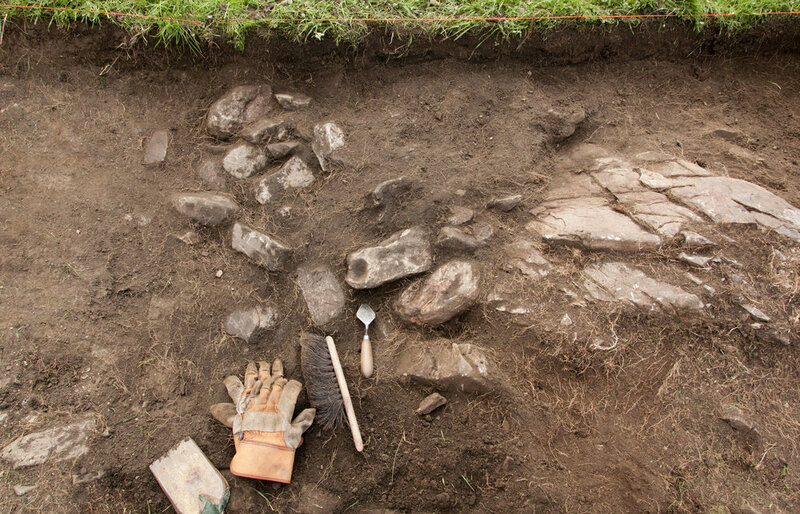 In Trench 2 Areas of the outcrop which were formerly covered by grass have now been revealed, but no new rock art has been discovered. So far. At lunchtime I sat upon a raised hummock of grass to eat a raspberry jam and cheese sandwich. I chose the hummock because it had a good view of Trench 2, and soon realised that I sitting upon an extension of the outcrop which was completely hidden under grass. I realised immediately that we should expand the trench, and everyone agreed. 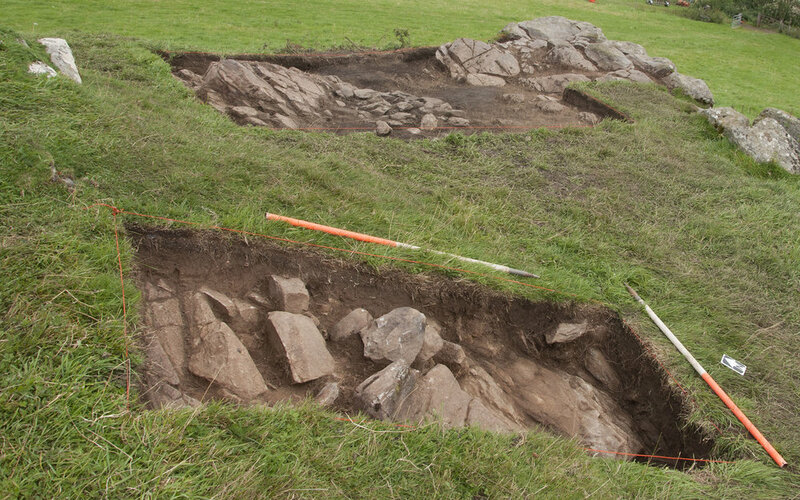 By mid-afternoon the turf had been lifted, extending Trench 2 to an area of around nine square metres. The hummock was a pyramid-shaped outcrop, and between this and the cup and ring marks must be a deep fissure filled with soil. Carefully digging into this with a spade I began to notice that the blade began to grate against stone — and it didn’t sound like outcrop. Now using a trowel, I removed another skim of soil, uncovering what appeared to be an area of rubble against the freshly revealed outcrop. The question of whether this rubble was natural was soon answered as I brushed loose soil way from these stones. Sitting in their midst was a small cup-marked boulder. Portable cup-marked stones are not unique. They have been discovered in areas such as Northumberland where they are sometimes found incorporated within the fabric of cairns. 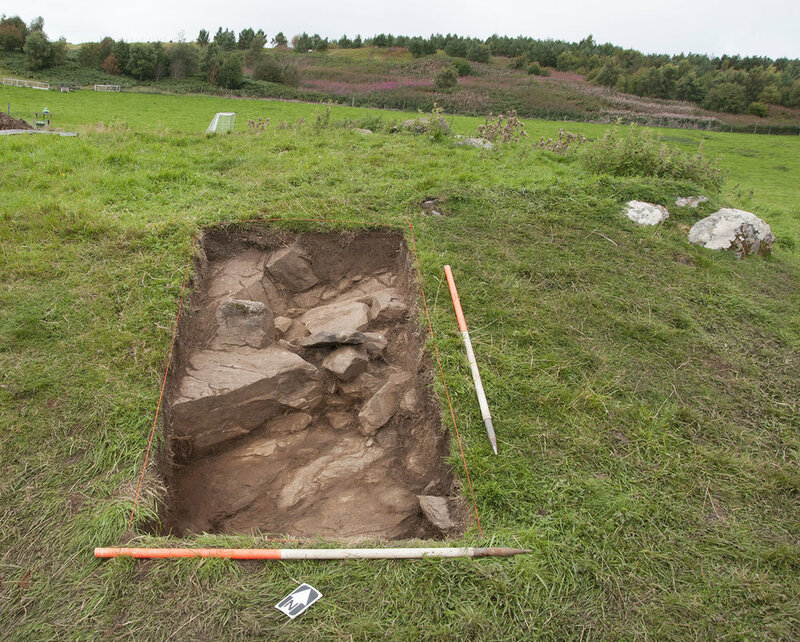 The context of this Strath Tay example within a rock art site may be unprecedented. Upon lifting the stone, the underside looked quarried. Had it been removed from the nearby outcrop?